ASP.NET AJAX v1.0 shipped. Hooray! I’m keeping my fingers crossed, anticipating that all the pain with various versions of ASP.NET AJAX co-existing in my machine, is over. Full-stop!. I hope many others went through this trauma of conflicts too. Now in my case, co-incidently, I got a new PC at office along with the new Mega Project that we are about to begin next month. So from now, only the shiney new AJAX v1.0 will exist in my machine. I just downloaded it (extensions) along with the Futures and Control Toolkit. Still have not checked what it looks like and hopefully, I might find sometime for it, while in Stockholm throughout the next week. Here’s where you can get your hands on it. Have fun. I was so excited about the release of ASP.NET AJAX 1.0 Beta, that I couldn’t wait till I got my hands on it. Here’s some quick notes about my experience so far. 1. The release is now made in three parts. One is the core Framework with only some of the features/controls (Script Manager, Update Panel and Timer 😦 ) but with full support from Microsoft. The rest of the controls from the previous release is now coming in a “value add” pack and finally the all-cool Ajax Control Toolkit. 2. A new template is now made available in the main VS Template set as ASP.NET AJAX enabled website (what a promotion). There’s anyway some work involved if you are migrating your existing ASP.NET AJAX apps. Remove / Replace the existing Microsoft.Web.Atlas.dll from the bin folder and add the new assembly (which is now also in the GAC). Add the other new DLLs (from the Value added pack and new AJAXControlToolkit) if you are using those features. Some other individual tweaks to the controls/properties that could be found in the migration document. So the much awaited “ASP.NET AJAX” (formerly known as Atlas) was released a little while ago as ASP.NET AJAX 1.0 Beta. Hooray! Here’s a quick guide on the Changes between the ASP.NET AJAX (“Atlas”) CTP and this Release and also the very important Migration Guide to convert CTP Built apps into v1.0 Beta. Whats keeping you waiting. Dive in! More updates to come soon! Here’s the link (just in case you dont see the Download button in Channel9) to the screencast of Nikhil’s latest presentation on ASP.NET AJAX at the JAOO 2006 conference in Denmark. Its interesting to hear about his dialogs with Ed Burns from Sun, who works on JSF and Bruce Johnson from Google, who is responsible for the GWT. 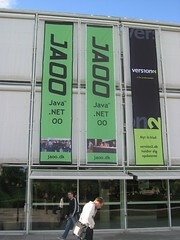 BTW, JAOO stands for Java and Object-Oriented Software Engineering. But it was nice to include .NET also into the scene.